Key app for Garage will let customers have packages delivered right into their garage. 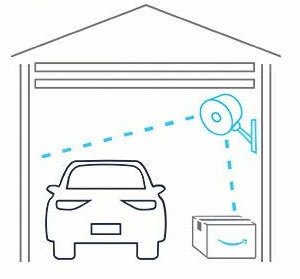 With Amazon Prime and the myQ Smart Garage Hub Amazon will be able to talk to your garage door opener so that it can be opened. The delivery person will be able to place the package and close the garage door. With the Amazon Key app you can use this service without being a Prime member. You also don't need a camera to record the delivery. Salt Lake City and surrounding areas are going to be supported so talk to us to get your myQ Smart Garage installed today. Martin garage doors dispel the notion that "parts is parts." Martin Door takes anything but a casual approach to the parts that make up its garage door. That's one of the reasons Martin Door can claim they manufacture "the world's finest and safest garage door." Taking a closer look at the unique roller that is part of each door, illustrates this approach. Like many of the Martin Door inventions, coming up with the perfect roller was an extended process for David O. Martin. It was a combination of learning from the school of hard knocks, combined with innovation. That process has taken over 20 years, according to Dave Martin. Martin wanted a roller with the quiet nature of nylon and the durability of steel. A roller made of nylon is too brittle, while a steel roller is too noisy. He had to work to find the best of both worlds. 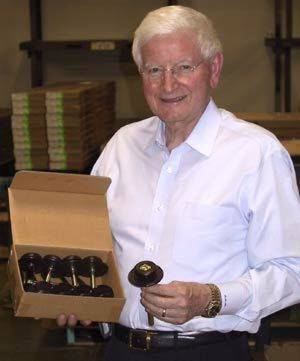 Dave Martin, CEO of Martin Door Manufacturing, shows off a box of the unique rollers that are a key part of each Martin garage door. 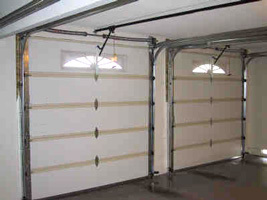 Not all torsion springs for garage doors are created equal. Not even close. Even though most springs look similar to the untrained eye, there is only one company in the world who dares to offer a lifetime warranty on both the door and the springs----a Martin Garage Door with galvanized torsion springs. 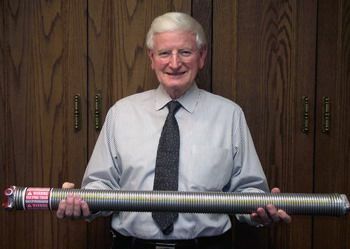 Not so coincidentally Martin was the first company to develop the galvanized torsion spring for garage door use in 1985. This completed a 25-year research process of finding the right engineering to make a spring that will last with the clean look and corrosion resistance that galvanizing offers. In the rush to save money by buying so-called imitation clean galvanized springs, many door dealers are actually committing themselves to an inoperable door sooner than they experienced with the old-style greasy or paint-flaking torsion springs. A small gathering of door companies in California illustrates the point. The door executives shared their concerns about the galvanized springs they were buying and about early fatigue issues. It was no surprise to learn none of the companies were using Genuine Martin Galvanized springs. One official said his experience with the galvanized springs he had purchased angered him to the point of wanting them outlawed and the spring manufacturers reprimanded. He admitted that he had no experience with Martin. Martin galvanized springs are engineered to last 20,000 to 30,000 cycles. This is a great complement to the Martin garage door product offering, which includes high cycle openers and high cycle garage door components.